Emissions trading programs are a long-established mechanism used by environmental regulators to reduce air pollution from the electric sector. The Title IV Acid Rain program, the NOX Budget Trading Program, the Clean Air Interstate Rule, the Cross State Air Pollution Rule, the Regional Haze trading programs, the Regional Greenhouse Gas Initiative in the Northeast, and California’s Cap and Trade program under AB 32 all serve as examples of environmental regulations that allow compliance through trading—usually based on total tons of emissions reduced. In the final Clean Power Plan, EPA provides a “panoply” of tools to help states utilize emissions trading programs to comply with the CO2 reduction targets established in the rule. Clean energy, energy efficiency, and highly-efficient fossil generators will all likely benefit under the proposed trading systems. But how does emission trading actually work under the final Clean Power Plan? What gets traded and who can do the trading? EPA’s subcategorized emission performance rates are the foundation upon which each of the above options is built and were determined by EPA to represent the improvement possible using the best system of emission reductions (BSER). However, because the BSER reflects impacts from shifting generation to zero- and lower-emitting resources, most existing units cannot meet these performance rates through operational changes alone. That is why EPA has designed each of the rate-based approaches to allow for emissions trading. 1. ERCs from eligible units. These are what we are calling “standard ERCs.” Standard ERCs are produced by new renewable, nuclear, energy efficiency, and biomass resources and certain other measures that can be shown to reduce electric-sector CO2 emissions (such as transmission and distribution measures that reduce line losses, upratings at existing nuclear or hydro plants, or demand response measures). Resources such as new NGCCs, energy storage, existing unaffected units (e.g., simple cycle gas turbines), capture of CO2 from the ambient air, non-electric sector measures (e.g., agriculture, forestry), and avoided emissions as a result of vehicle electrification are specifically not allowed to produce ERCs. Generators or savings measures that were built or installed on or after January 1, 2013 can begin producing one ERC for every one MWh of energy generated or saved starting on January 1, 2022. There are, of course, a few exceptions to this rule. Prorated ERCs: EPA allows biomass and waste-to-energy resources to produce ERCs, but prorates them based on the proportion of biogenic CO2 compared to total CO2. Clean Energy Incentive Program (CEIP) ERCs: The CEIP provides an incentive for early installers of certain types of renewable energy and energy efficiency measures. Under this program, wind and solar resources and low-income energy efficiency measures installed after submission of a state’s final compliance plan (September 6, 2018 is the deadline, but states can submit plans earlier) can produce ERCs in the years 2020 and 2021 that can be used by fossil generators during the compliance period. For every MWh of energy generated by wind and solar resources, the state awards 0.5 “early action” ERCs and EPA will award 0.5 matching ERCs from a pre-established pool of ERCs. Further, for every MWh of energy savings resulting from qualified low-income energy efficiency programs, the state awards one “early action” ERC and EPA will award one matching ERC from the CEIP ERC pool. EPA has capped the CEIP ERC pool at the equivalent of 300 million short tons, though how this will be translated to ERCs has not yet been explained. Standard ERCs (including CEIP ERCs) can be used at both combustion turbine (NGCC) units and fossil steam (coal) units to reduce their overall emission performance rate. Essentially, EPA wants to give credit to existing NGCCs for upping their capacity factors since that helps to displace higher-emitting fossil generators, thereby reducing total emissions from the electric sector. As one way of trying to ensure that this shift actually happens, EPA requires that gas-shift ERCs may only be used for compliance by fossil steam units. 3. ERCs from highly efficient existing fossil units. If the actual rate is lower than the assigned rate, this equation tells us the number of ERCs that the unit produces. ERCs produced in this way reward existing generators for performance above and beyond what the state has required. However, if the actual rate is greater than the assigned rate, then this equation tells us how many ERCs the resource needs to acquire in order to meet the assigned standard. The table below summarizes some of the important features of each ERC type. * “New renewables” includes new wind, solar, hydro, wave, and tidal resources. “Energy efficiency” includes building codes and appliance and equipment standards. “Other” includes volt/var optimization, waste-to-energy, DSM, CHP, and other resources. Because generators under each of the compliance pathways could have a different assigned performance rate target, EPA appears to limit interstate trading of ERCs to states that have approved plans under the same compliance pathway. (This is not completely clear from the Clean Power Plan text, but seems to be EPA’s intent.) If two states both choose the R1 compliance approach, which is EPA’s preferred approach and the basis for its Model Rule, resources in each state can trade ERCs freely. In fact, as many states as choose the R1 compliance pathway can trade ERCs without having to develop a joint compliance plan. On the other hand, if two states each choose the R2 compliance approach, they may only trade ERCs if they first coordinate with each other to establish a common state-average emission performance rate that represents the weighted average of both states’ fossil steam and combustion turbine generation and submit a joint compliance plan. Finally, a state choosing the R3 approach, in which that state’s units are assigned unique performance rates, cannot allow its units to trade ERCs with units in other states; however, the state can set up a trading program that allows its units to trade ERCs among themselves, on an intrastate basis. The figure below illustrates the potential trading interactions across states and compliance pathways. In this diagram, units in each single state (represented by “AA”, “BB”, etc.) may trade ERCs within each solid circle, representing trading between units in the same state. 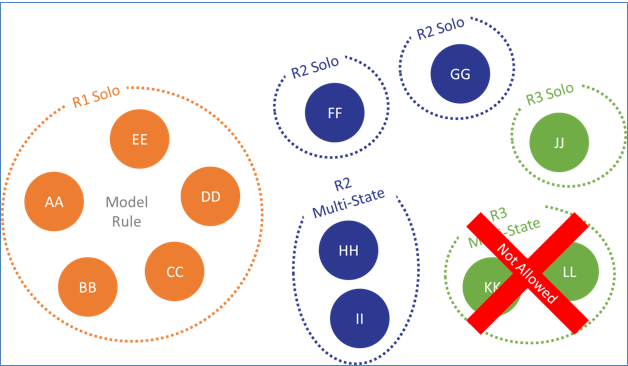 Beyond that, units can only trade with units in other states that are taking the same approach, or are working together to meet an agreed-upon approach, represented in this diagram by the dotted circles. With one limited exception, ERCs can never be produced by resources or measures in a state that has opted for a mass-based compliance approach. The exception involves renewable energy resources that are physically located in a mass-based state but are electrically connected to a rate-based state. These resources must have a contract (such as a power purchase agreement) showing that the power from the renewable energy resource will serve customers in the rate-based state, thereby displacing generation in that state. One more interesting tidbit on ERCs is that they can be produced by resources located in areas that are not covered by the Clean Power Plan, such as Vermont, Washington D.C., certain Tribal lands, and even Canada or Mexico. Qualifying resources in these regions can produce ERCs as long as they are electrically connected to a rate-based state. Click here to read Part II on mass-based trading.